ATMA, Anti-Tobacco Movement at Amrita, launched by the Amrita Institute of Medical Sciences, started functioning on Tuesday. It was inaugurated by former minister K.B.Ganesh Kumar. Swami Poornamritananda Puri, general secretary of Mata Amritanandamayi Math, delivered the benedictory address and City Police Commissioner Dinendra Kashyap administered the oath of ATMA. K.G.Viswambharan declared Amrita campus as `No tobacco zone’. The students and the staff of the hospital also formed a human chain to pay tribute to this noble venture. The hospital also organised an exhibition to create awareness about the hazards of tobacco use. The exhibition will be on till June 5. 25 houses in the Alappuzha district are ready for habitation. The work on the 125 other houses is about 80 percent over. 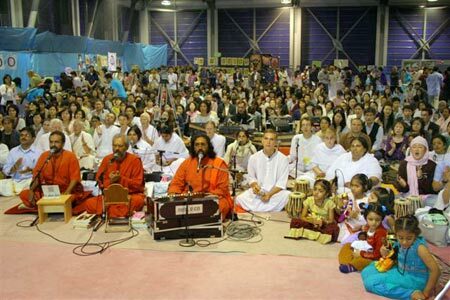 The ashram is building two types of houses here according to the two plans provided by the government – one for houses close to the sea and one for those that are further inland. Construction of houses is progressing at a fast pace in the 1, 3, 4 and 5th wards of Alappad Panchayat. Within 15 days from the start of work the piling for a 100 houses is over and the work on the super-structure has started. At each stage of construction government officials have been inspecting the work and giving sanction for the next stage. The government has prohibited re-construction of houses which had been right on the sea coast. They have provided an alternate site in Kulashekharapuram across the backwaters for the displaced.The ashram has finished concreting work of the 16 houses allotted there. There are over 1,200 people, including brahmachari’s, brahmacharini’s and volunteers working day in and out on the construction of houses. 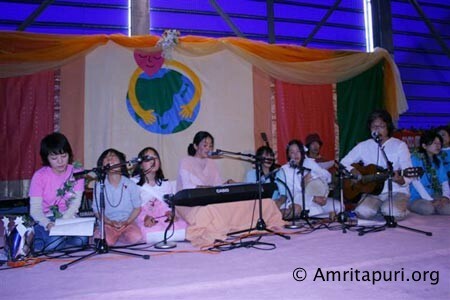 The ashram conducted two five day camps for children of the tsunami affected areas of Alappad and Alappuzha in the ashram itself. 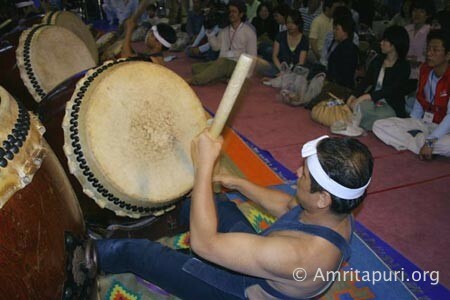 There were classes on yoga, sanskrit, spoken english and character development. The children were lucky to have the opportunity to have direct interaction with Amma — they had question answer sessions, sang bhajans and performed for Her. The children had an opportunity to express and enhance their creative abilities in special drawing and clay modeling The ashram looked after the accommodation and food for approximately five thousand children who participated in the camps. classes. The children were also given certificates of participation. 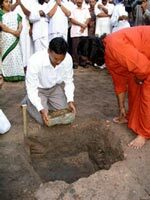 The reconstruction work in Pudukuppam, starting with reconstruction of houses was initiated by the ashram with Brahmachari Abhayamrita Chaitanya laying the foundation stone. Under the auspices of the ashram 12 marriages have been solemnised so far in the coastal belt near the ashram, with the ashram providing gold ornaments, clothing and arranged for the marriage feast. In Tamil Nadu the ashram salvaged 190 motor boat engines from under sand and debris, repaired them, provided new propeller shafts and handles and gave it back to the fishermen. 96 damaged boats were repaired and reconditioned with Fiber Reinforced Plastic (FRP) and returned to the fishermen of Nagapattinam. 21 boats were repaired and reconditioned with Fiber Reinforced Plastic (FRP) and returned to the owners in Pudukuppam in Cuddalore district. Ten fiber glass boats have been made by the ashram and are ready for allotment. The cost of one boat is about 2 to 2.5 lakh rupees. On an average a boat would be a means of livelihood for seven to ten fishermen families. In Alappad, the district collector Shri. B. Srinivas laid the foundation stone flagging off the construction of houses in Alappad by the ashram. 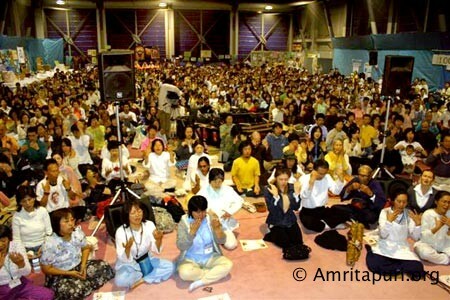 Amma left Amritapuri this morning for 8 weeks of spiritual programmes to Japan, USA and Canada . Amma will hold programmes in 12 cities in this two months tour. As is usual there will be satsangs, bhajans, meditation sessions and darshan at all the programmes. This is the 19th year Amma is visiting the United States. 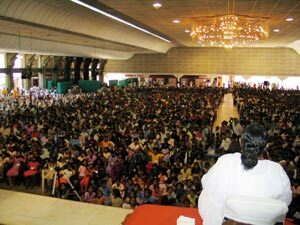 Amma will be back in Amritapuri in August. 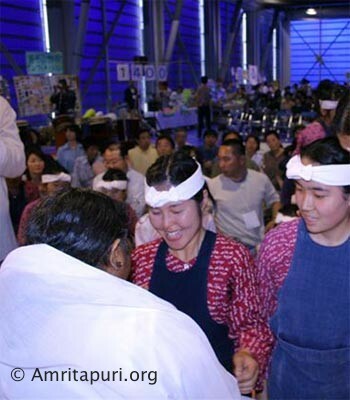 Amma had cancelled all her programmes in North India and overseas earlier this year as the Ashram had undertaken massive tsunami relief (news) work. A second educational camp for tsunami-affected children was held at the Ashram, this time for 6,000 kids from the neighboring district of Alappuzha . The children were given free classes in spoken English and in yoga. 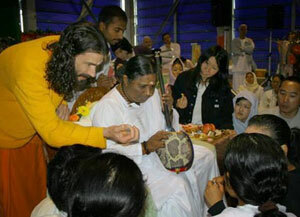 They also had many classes with the swamis and, of course, question-and-answer sessions with Amma. 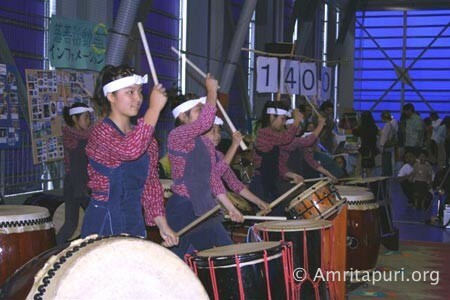 The idea behind the camp was to give the children something positive towards which they can redirect their minds during their summer holiday, thereby helping them to get over the mental shock created by the tsunami. Yoga acharyas from the Patanjali Yoga Vidya Peetham and English teachers from the Amrita Educational Institutions taught the classes. The first TIFAC-CORE in Biomedical Technology, Amrita TIFAC-CORE, was inaugurated at the Amritapuri Campus of Amrita Vishwa Vidyapeetham on Saturday by the secretary of India’s Department of Science & Technology, Professor V. Ramamurthy. Dean of Amrita University Mr. Nambootiri, Professor V. Ramamurthy of Department of Science & Technology, , Swami Amritaswarupananda, Vice Chancellor P. Venkat Rangan during the inaugural function of Amrita -TIFAC CORE. The Technology Information, Forecasting & Assessment Council (TIFAC) of the Department of Science & Technology was set up in 2000 to pioneer research in the emerging advanced areas of science and technology, as part of President Kalam’s Technology Vision 2020 objectives. It also aims to create an environment to produce world-class manpower to work on technologies and solutions that are of direct relevance to India. As part of this objective, TIFAC identifies institutions for developing “Centres of Relevance and Excellence” (COREs), carrying out focused research in critical areas. The Centre for Biotechnology, School of Applied Sciences at Amrita Vishwa Vidyapeetham, Amritapuri, Kollam, Kerala, has been identified by TIFAC as a CORE in Biomedical Technology. Amrita was identified as a CORE primarily due to its established strengths and capabilities in diverse disciplines of engineering, medicine, information technology and basic sciences. Amrita TIFAC-CORE will pioneer interdisciplinary education and research in biomedical technology in collaboration with the industry and the government. 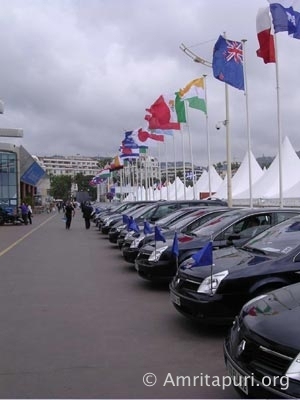 The total investment for the CORE over a period of three years is estimated at around Rs. 8.4 crores to be funded through the collaboration. The immediate objective of the CORE is to develop biocompatible materials and devices for medical applications in the treatment of diabetes and related diseases, as Kerala has one of the highest diabetes rates in the world. Biomedical technology is still at its nascent stage in India and is expected to substantially influence the ongoing development towards improving medical devices and developing new drugs for reducing human suffering due to diseased states. Amrita Centre for Biotechnology, set up in 2004 at Amritapuri Campus, an integral part of the CORE, offers academic programmes in the areas of biotechnology and bioinformatics. The Centre is well-equipped with state-of-the-art facilities and other advanced instrumentation and has already succeeded in attracting experienced academics and researchers from India and abroad to work on pertinent research areas. “Darshan – The Embrace”, a film on the life of Amma has been officially selected for showcasing at the prestigious 2005 Cannes Film Festival. Jan Kounen, an award winning filmmaker who was born in Netherlands and is based in France, directed the film. Manuel De La Roche of France, is the producer. 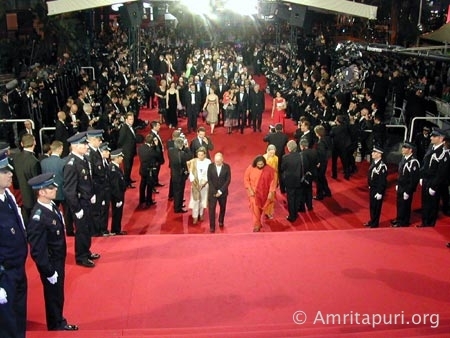 The film festival now in its 58th year is taking place 11 – 22 of May 2005. 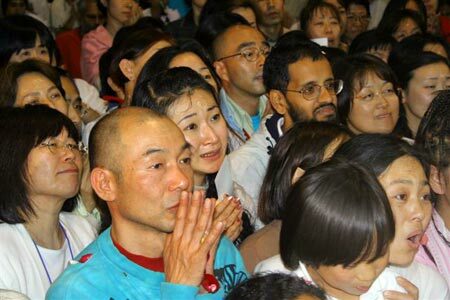 Darshan – The Embrace will be screened on 18th May 2005 at 10:15pm. 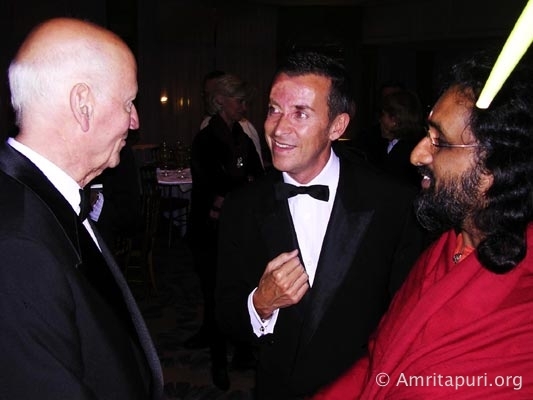 Jan Kounen and his crew began shooting the footage for the movie in 2003 during Amritavarsham50, (news) Amma’s 50th Birthday celebration in Kochi. 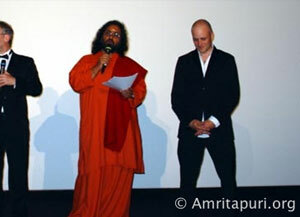 Afterwards, Kounen and his team traveled with Amma on Her Indian and International tours in order to complete the movie. Jan Kounen has several feature films to his credit, including 2003 Blue Berry – A ‘mystical western’ that starred Vincent Cassel, Juliette Luweis and Micheal Madison. “I want to present the portrait of a women, who as a young girl had a vision which made people feel she was going crazy. 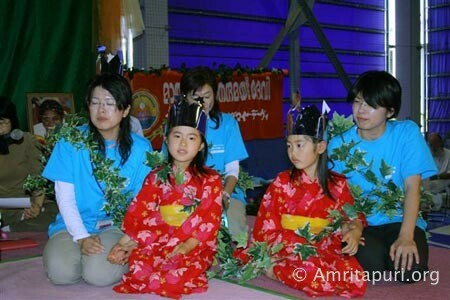 I want to document the journey of that girl into her present avatar as ‘Amma'”, Kounen said. 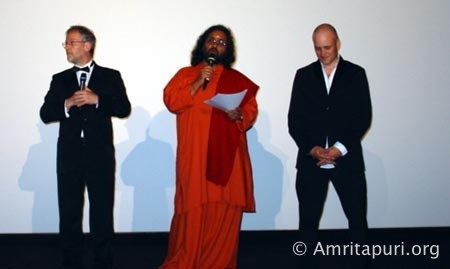 About the film, Kounen says, “when I first took up the project and started filming, I thought, ‘Amma is a good person, doing good things, in turn I can do something good for Her’. But as it went on, I realized, no, I am the one who is receiving the gift”. The organisers and producers had extended an official invitation and were very keen that Amma will honour them by being present as the Guest of Honour during the festival and screening of the movie. Amma has conveyed Her best wishes and blessings for the function and will also be sending a video message which will be screened at the festival. 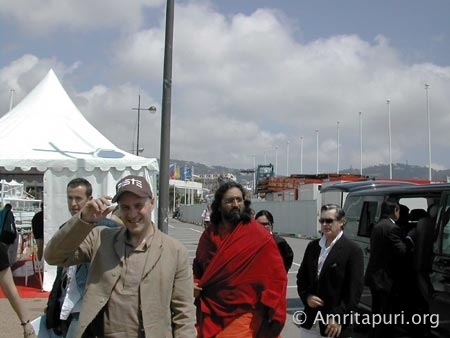 Amma has directed her disciple Swami Amritaswarupananda to represent on Her behalf at the Cannes Film Festival. Mr. Sudhakar Jayaram, General Manager, Amrita TV, will accompany him. The official selection of the movie on Amma’s life at Cannes Film Festival is a significant not only for Amma’s devotees and admirers across the world, but to all the spiritual people across the globe. 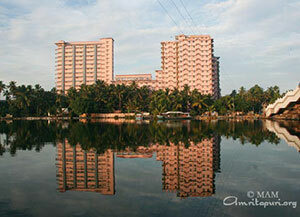 Nowhere on earth is life lived as fully as it is in Amritapuri. Every nook and corner of the ashram sparkles with dynamism. From the stillness of the morning hours when the ashram is rapt in meditation to the vibrancy of the night when the air is filled with Amma’s ecstatic bhajans, Amritapuri is always wonderfully abuzz. In the glow of yagna fires where the pujaris perform Vedic rituals, in the silence of the library where young monks study Bharat’s sacred scriptures, in the sweat falling from the backs of those maintaining the ashram through seva and karma yoga, and of course in the lap of Amma, who is forever sharing Her boundless love in the darshan hall—Amritapuri is truly, as its name indicates, the City (Puri) of Immortal Nectar (Amrita). 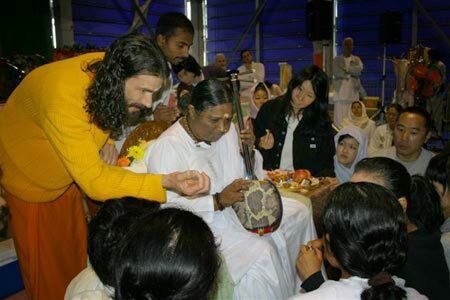 The inspiration for the activity is and always has been Amma. 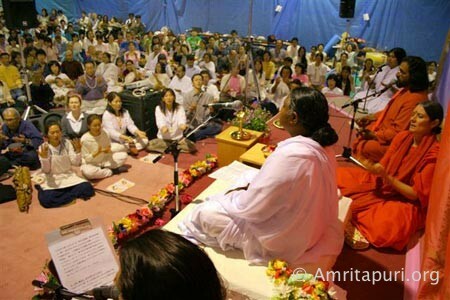 Thousands come to the ashram everyday for Her darshan. 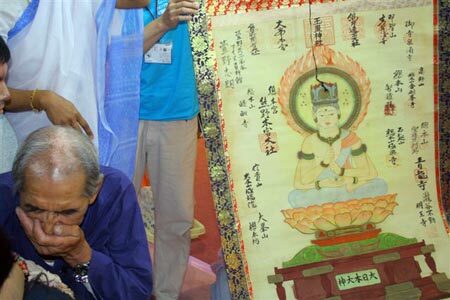 Some are seeking spiritual guidance, others want to unburden their sorrows, and many want to simply spend a few moments in Her arms. 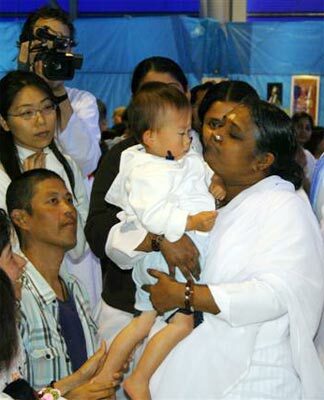 Amma sees each and every person, no matter how long it takes, giving each person exactly what they need. 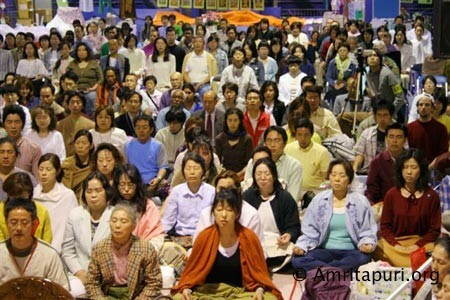 In many ways, the ashram is a university where people of all walks of life have come to study the science of life. 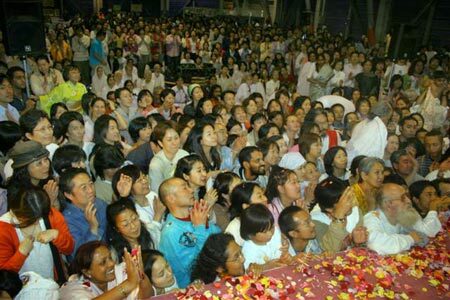 When Amma is not giving darshan, She is leading the ashramites in meditation, instructing them in their spiritual practices and edifying them with Her immortal wisdom. 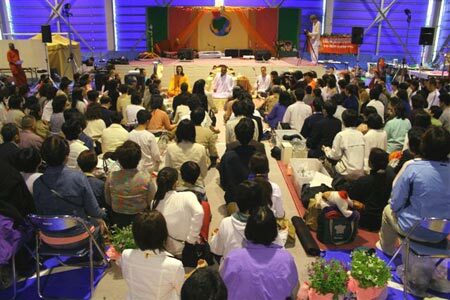 There are classes in yoga, Sanskrit, Vedanta and meditation. 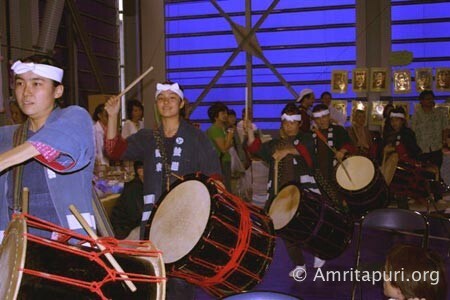 At Amritapuri, the ashramites and the devotees form a big family under Amma, and together they celebrate many religious festivals — Krishna’s Birthday, Onam, Christmas, Vishu, Guru Purnima, Shivaratri, Navaratri, Divali — but in truth each day at Amritapuri is a festival. 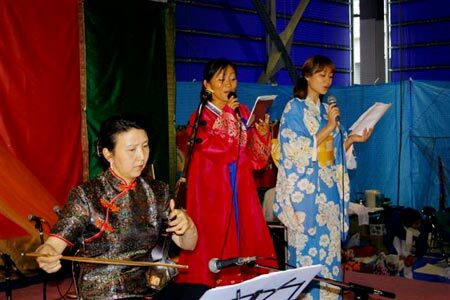 This is reflected in all who come here — the sense of peace, joy and fullness that radiates from their faces. On the first night of Amma’s Trivandrum Brahmasthanam Festival, Amma handed once again handed over keys to houses. But these keys were given not given to the poor, but to the government. The 10 homes were constructed to serve as much-needed halfway houses for patients of the Mental Hospital of Trivandrum. Many times when people are released from such hospitals, they do not have anywhere to go, especially when family members are no longer interested in supporting them. These houses, which are for all purposes an additional ward of the hospital, provide both homes and a community for people who no longer need the 24-hour-a-day monitoring of a psychiatric ward, but still are taking medication. The houses have been built in two blocks, five houses for men and five houses for women. Amma handed the symbolic key over to the Health Minister of Kerala, Sri. K.K. Ramachandran Master, who then handed it to Dr. Jayram, the Superintendent of the Mental Health Centre of Trivandrum. Also on the dais were Sri. K. Mohan Kumar, MLA and President of the District Congress Committee; Dr. B. Mahila Mony, the Director of the District Health Department, and social worker Sri. P. Govinda Pillai. The foundation stone for the houses Mata Amritanandamayi Math is building for tsunami-affected people in Alappad Panchayat was laid today at 8:00 a.m by the district collector of Kollam, Sri. 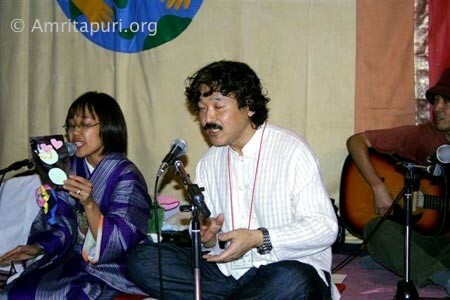 B. Srinivas. The Kerala government has allotted 1,200 houses to the Ashram for reconstruction in Alappad Panchayat [this number is continuing to increase as time goes on and the government continues to allot more and more houses to the Ashram]. This is in addition to the 200 houses allotted to the Ashram for reconstruction in the districts of Ernakulam and Alappuzha. The Ashram has already completed rebuilding the houses in Ernakulam, having handed them over to the district administration on 11 April. The construction of the houses in Alappuzha is in progress. After brahmacharis of the Math performed a foundation-stone puja, the vice chairman of the Math, Swami Amritaswarupananda, welcomed the gathering. Sri. Vijayakumar, the deputy collector; Mrs. Maniamma, Tehsildar of the Karunagappally taluk; Mrs. Leelabhai, president of Alappad Panchayat; Mrs. Kasturi and Sri. M.V. Shaji, members of Alappad Panchayat; and various office-bearers of the karayogam were also present.